Posted for: Audrey Hamelers, Digital Library Intern, Spring 2010. The Barry-Hayes collection, housed at the Independence Seaport Museum, includes the naturalization certificate of Patrick Hayes, the adopted son of John Barry. This certificate, issued on April 8, 1822, provides an interesting example of the naturalization requirements in Pennsylvania and the United States at that time. According to his naturalization certificate, Patrick Hayes applied for United States citizenship at the Supreme Court in the City of Philadelphia “having on his solemn oath declared, and also made proof thereof by competent testimony, that he had resided within the United States upwards of two years, and within the State of Pennsylvania upwards of one years immediately preceding his application.” This was on September 2, 1794, meaning that the naturalization process underwent by Patrick Hayes was that decreed by the Naturalization Act of 1790, which lists a residency of two years in the United States among its requirements. However, Patrick Hayes was not issued this certificate of naturalization until 1822, thirty years after the listed date of application. One reason for this may have been that the 1790s saw naturalization law change not once, but three times. This certificate of naturalization may give us an idea of the experience of gaining citizenship in a young country, whose laws were still being developed. Witnessed by William Atlee in 1822. Just a few months after Patrick Hayes applied for United States Citizenship, the Naturalization Act of 1795 was passed in January of that year. This act, which replaced the 1790 law, states that a person seeking naturalization must “declare an oath or affirmation, before some one of the courts aforesaid, that he has resided within the United States, five years at least, and within the state or territory, where such court is at the time held, one year at least.” In addition, this act adds a required waiting period of three years between an application for naturalization and receiving citizenship. Three years later, the Naturalization Act of 1798 increased the residency requirement from five to fourteen years, and increased the waiting period from three to five. This act, which was one of the controversial and short-lived Alien and Sedition Acts passed by a Federalist Congress, attempted to disenfranchise potential immigrants who might support their rival Democratic-Republicans. This act was repealed in 1802, at which time the law reverted back to the Naturalization Act of 1795, which is still used as the law of naturalization in the United States today. It’s not clear whether Patrick Hayes’s status as a naturalized citizen of the United States was affected by these changes in the law, or whether there is some other reason for the date discrepancy. More complete information might be discovered through further perusal of the Barry-Hayes collection. 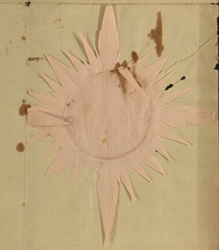 A star-shaped seal that appears on the certificate.